Earlier this year I was involved in facilicating participation in the TERENA Lecture Recording competition which took place at their annual conference. The conference took place in Reykjavik, Iceland. 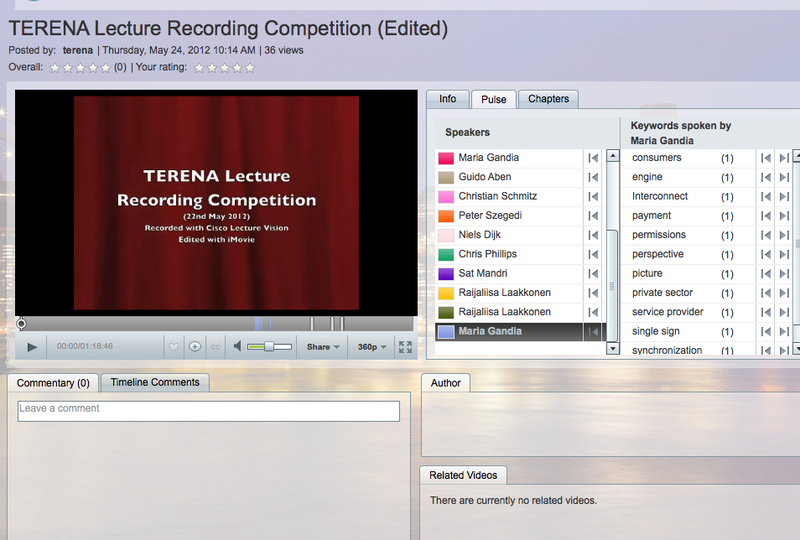 The purpose of the competition was to allow different lecture recording tools to be showcased and compared. A number of people ( 16 ) were invited to present a short lecture in a lecture theatre in sequence. A video camera captures the lecturer, a microphone captures the lecture audio and a video feed was provided of the lecturer’s power point presentation – all of this was organised by the event organiser. The signals were split and each lecture recording solution combined them to provide the finished product. Cisco has a lecture recording solution which consists of a number of its products working together as follows. Using a Cisco C60 video CODEC which takes the three inputs provided and combines them for transmission and recording on a Telepresence Content Server (TCS). Cisco MXE – Media Exerience Engine which converts the video into a number of formats which can be configured in advance. Cisco Show & Share – a video portal where the finished product can be viewed via a computer web browser or hand held device. The recording solution is cloud based – in this case the back end equipment which include the Telepresence Content Server (TCS), MXE and Show and Share Server are all based at a Cisco Lab in Cisco’s campus at San Jose, California. So the video stream needs to traverse the Internet to get from the CODEC at the lecture theatre to the TCS at San Jose. The event lasted just over an hour with 16 short lectures being delivered on a variety of topics. The recording is started by an operator at the lecture theatre connecting the codec to the TCS in San Jose ( this is a one button press operation). After the last lecture is finished the call is dropped and the recorded video is passed to the MXE for transcoding, then on to the Show and Share Server for publication and viewing. This process takes approximately the same time as the duration of the recording. A second task is automatically done by the MXE – this is called Pulse Analytics – which scans the audio track to create a voice print for each speaker and then to create a key word index of the spoken words this adds a further period of processing time. In all it takes 2 times the duration of the recording before it will appear on the Show and Share server. At this point it is worth having a look at the end product. Click here to view the video on the Show and Share Portal. Notice that you can click on a speaker name in the speaker list to jump to a particular speaker and then click on the key word index to jump to occurrences of that word in the recording of this speaker lecture. If you select a particular speaker first you can see that the key work index shows the key words used by that lecturer. Can you imagine how a tool like this could be used in Education!!!! Lecturers/Teachers can record their lessons so pupils/students can view them again – or even view them before attending class!! See my post on the Flipped Classroom.